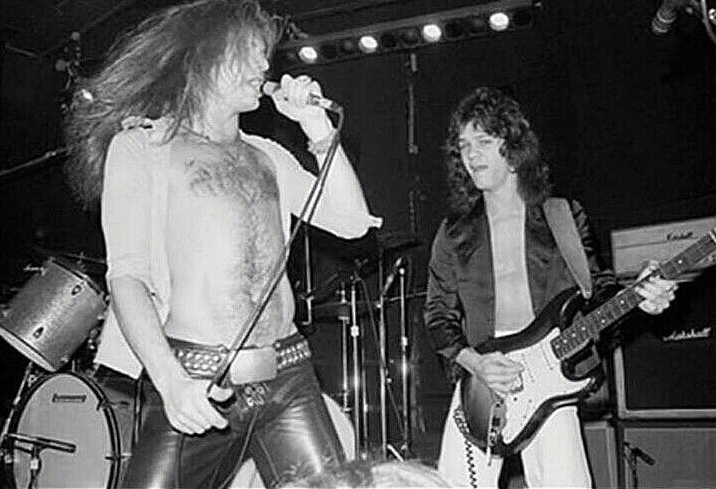 Eddie Van Halen and David Lee Roth on stage in early 1977. Check out the clip below to hear Van Halen’s complete “Zero” demo. A compilation of 28 fantastic early versions of some of the band’s most famous songs, with many of them eventually featuring their official 1978 debut release, Van Halen. According to a January 4, 1977, L.A. Times article by Robert Hilburn, entitled “HOMEGROWN PUNK,” the whole thing came happened when Rodney Bingenheimer saw Van Halen at the Gazzarri club in the summer of 1976, and later took Gene Simmons of Kiss to see the band perform. Gene Simmons then financed the demo tape with recording beginning at the Village Recorder studios in Los Angeles and finished with overdubs at the Electric Lady Studios in New York. Apparently Simmons wanted to change the band’s name to “Daddy Longlegs,” but luckily the band stuck with Van Halen, with Simmons opting out of further involvement after he took the demo to Kiss management and was told that “they had no chance of making it” and that they wouldn’t take them… Big mistake.